Here are my picks for the best local cause marketing programs of 2011. My criteria for picking these promotions wasn't based on dollars raised, but on how well they represented the potential for local cause marketing. In short, these programs inspired me and made me proud to be a cause marketer. I hope they do the same for you! If you know of other local programs that should be added to my list - good or bad - include them in the comments section of this post. Also, I'm looking for some great cause marketing promotions to include on my cause marketing page on Pinterest! Details: Customers can create their own virtual food drive and invite friends, relatives and co-workers to support it. Why it’s on the list: I love online cause marketing when I can find it. This program fits seamlessly with Peapod's business model. You shop online for yourself. Now you can shop online to help others. I'm a big fan of the Food Bank for NYC. They have a great mission and do great cause marketing all year long! Details: Every time you buy one of Tevolution's delicious teas you can enter the text code behind the label to donate $0.25 to one of four causes. Why it's on the list: I like that Tevolution started runs a business with one thing in mind: to make and sell an outstanding iced tea. The best way for a business to help a cause is to be a great business FIRST, and that's Tevolution's first priority. I also like that the two co-founders of the company saw the value and promise of using SMS for consumers to direct their donations to one of four charities. Details: For a donation of $20 to Big Brothers Big Sisters, Great Wolf Lodge guests can enjoy a meal inside a life-size gingerbread hsouse through December 25. Why it's on the list: For those of you who regularly read my blog, you know I love holiday cause marketing, especially experiential cause marketing. This Christmas promotion won't raise the most money, but it's unique, creative and memorable. Details: This program has cashiers selling pinups for $2 at the register. Drive thru guests get a special insert with a QR code to scan to learn more about the program and donate on their smartphones. Why it's on the list: This simple, transactional cause marketing program has already raised nearly $20,000 for the Chatham-Savannah Authority for the Homeless. It shows what great, local cause marketing can accomplish when people are motivated, committed, and persistent. Details: Executive director Julie Nations recruited 40 businesses that each committed to donating a minimum of $1,000 through purchase-triggered donation programs. For example, a local dry cleaner offered customers 20% off the cleaning of pink products with 5% of the cost going to the Ellie Fund. A local e-tailer sold a special pink ribbon clip and donated 10% of the proceeds to the charity. Why it's on the list: Just as Maggie Keenan in Savannah, Georgia showed us that any cause and company can do point-of-sale, Julie shows the potential of purchase-triggered programs for nonprofits. The Ellie Fund's cause marketing program is a great example of using the assets you have on hand to create a program that rasies money and awareness for YOU. Details: Shelter Scotland offered real value to customers that checked into eight thrift stores. They offered a buy two, get one free special for both new and loyal customers on every sixth check-in. Foursquare users also earned unique badges - wonderfully designed by a noted Scotland designer - for each store. When you collected all eight you were entered into a contest to win prints of the designs. Why it's on the list: This is special addition to my list because Shelter Scotland didn't have a company partner for this program, which, according to my own definition doesn't make it cause marketing. Instead, it created the Foursquare program for its own business, a chain of thrift stores. While the program could be enhanced with a for profit partner, it's a great example of Foursquare cause marketing for nonprofits that have storefronts (e.g. Goodwill). Details: The weekend of the Boston Marathon the PUMA store on Newbury Street put a treadmill in its front window on which passerbys could run a mile a two. For every mile logged PUMA donated a pair of shoes to Soles4Souls, a nonprofit that provides shoes to poor people around the globe. Why it's on the list: While this promotion was created by an international footwear company, it shows just how easy cool cause marketing is for even just one store. If you run a bakery you can sell a special cupcake to benefit a cause. If you run a hair salon you have a cut-a-thon. And if you sell running shoes you can set up a treadmill on which visitors can run a mile or two to support a cause. You don't have to be big to be bold! These are my picks for best local cause marketing programs for 2011. Here's my pick for the worst. Details: One Kentucky Fried Chicken location in Utah ran this promotion: Buy a HALF-GALLON of soda -- with 800 calories from 56 spoonfuls of sugar -- for $2.99 and a buck goes to Juvenile Diabetes Research Foundation. Why it's on the list: This program was just wrong right from the beginning. Campaigns for health causes in fast food chains shouldn't involve menu items, unless they are healthy meals. Connecting a large soda with something like diabetes - even Type I diabetes, which I'm told is a genetic condition not related to diet - just isn't smart. If I can make mistake Type 1 and Type 2 so can millions of Americans. 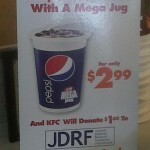 This program was a disaster for JDRF, KFC, and gave cause marketing a stinging black eye. In 2011, I published a guest post and wrote a post on two campaigns that deserved a critical eye. I'm not including them in in my official list because they're not local promotions. However, you should read them so you can kick off your own cause marketing programs in 2012 without incident. I would hate it if next year you ended up on my naughty list.